Patient 3 was a 32-year-old man with an 8-year history of a choreatic-dystonic syndrome, dysarthria and generalized epileptic seizures who presented with recurrent distressing tasteless belching . The frequency of belching had progressively increased over the previous year and had become extremely debilitating leading to severe depression. The patient also exhibited dramatic tongue-biting. Feeding was problematic and he had lost 20 kg during the previous year. Walking was disturbed by intermittent dystonia of the left foot and bilateral choreatic movements causing a jerky gait. Trunk flexion movements and a moderate back-arching dystonia were occasionally observed. Moderate cognitive impairment was obvious on clinical examination but neuropsychological testing was impossible because of dysarthria. The patient had 10% of acanthocytes among the circulating red blood cells and a single intronic mutation in the VPS13A gene was detected, suggestive of the diagnosis of ChAc. Brain MRI, thoracic radiography and endoscopy of the upper gastrointestinal tract were normal. Videofluoroscopy showed normal deglutition and slight hypotonia of the inferior esophageal sphincter confirmed by manometry. EMG of the diaphragm demonstrated prolonged, recurrent, arrhythmic contractions of both diaphragmatic domes. 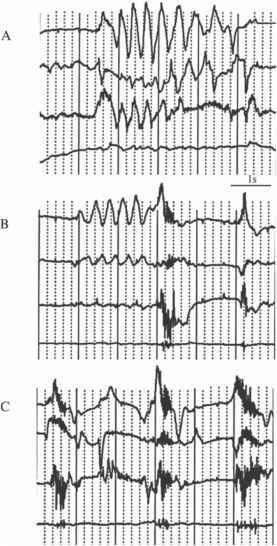 Recording of respiratory muscles with surface electrodes revealed severely dyskinetic breathing frequently associated with violent belching (Fig. 5). Risperidone (up to 8 mg per day) was ineffective. Patient 4 exhibited a progressive choreatic syndrome associated with muscular weakness at the age of 41 . A brother and maternal uncle also had chorea. Investigations revealed 10% acanthocytes among the circulating red blood cells, compensated chronic hemolysis with splenomegaly, increased muscle enzymes and a sensory axonal neuropathy. 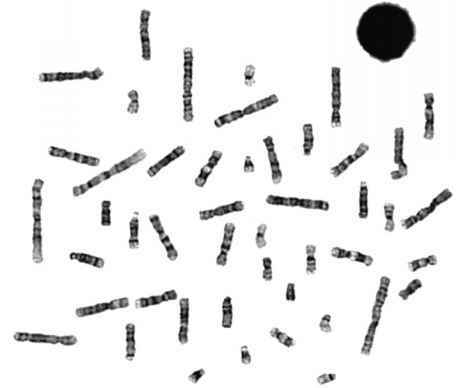 Weak expression of red blood cell Kell antigens and a mutation in the XK gene were consistent with MLS. MRI revealed moderate atrophy of the caudate and putamen. Six years later the patient presented with progressive deterioration with severe generalized chorea, predominantly on the left, with hypotonia, postural instability causing repeated falls. He had moderate cognitive impairment (Mini mental state 28/30, Mattis scale 127/140). Tiapride (maximum dose 150 mg/d), risperidone (maximum dose 5 mg/d), and olanzepine (maximum dose 30 mg/d) were introduced without benefit, but with adverse sedative and cognitive effects. (FHC, Bowdoinham, ME, USA) with an Alpha-Omega system (Micro-guide, Nazareth, Israel). At the end of each track, micro-stimulations were performed through the same micro-electrodes with a current intensity up to 10 mA in order to detect the per-operative occurrence of adverse effects. The final implantation sites of the definitive electrodes for chronic stimulation (DBS - 3387 electrode Medtronic®) were guided by the longest recording of GPi neuronal activity and the absence of visible side-effects after micro-stimulation. Electrodes were secondarily connected to a pulse generator (Kinetra, Medtronic®) internalized in the subclavicu-lar region (Medtronic, Model 7425). A cerebral CT scan was performed three days after electrode implantation to identify electrode positions, and images were combined with the pre-operative 3D T1-weighted MRI. The post-operative location of electrode tracks was determined on a basal ganglia atlas consisting of the contours of basal ganglia structures traced and digitized from a brain specimen obtained at autopsy (Fig. 6). Three-dimensional surfaces constructed from these contours were co-registered with the patient's MRI by using specially designed algorithms . For Patient 3, initial stimulation settings involved the two lowest contacts with a voltage of 2.5 V, a frequency of 120 Hz and a pulse width of 90 |is. Within a few days after the onset of stimulation, a dramatic decrease in belching frequency and dyskinetic breathing was observed. Choreic and dystonic movements involving the lower limb and axial muscles completely disappeared, as did tongue-biting. However, after 2 months a partial relapse occurred, and belching and breathing dyskinesia reappeared, although tongue-biting did not. Changes in stimulation settings (voltage, frequency, contacts) were ineffective. MRI revealed that the right electrode was positioned at the border of the putamen and globus pallidus external segment (GPe). We therefore decided to re-operate on this patient in order to reposition the electrode. The first right electrode was left in place and a second electrode was introduced more medially on the same side. After the second implantation, contacts 0 and 1 (the two lower contacts) were located within the GPi on both sides. Contact 2 was at the border between the GPi and GPe and contact 3 within the GPe, bilaterally (Fig. 6). A double-blind evaluation was performed 3 months after this second intervention. Chorea, belching and dysarthria were improved by GPi 40 Hz stimulation compared to the "off' condition. The dystonia sub-score was slightly improved by 120 Hz GPi stimulation but at this frequency, chorea and dysarthria were worsened with drooling. There was no effect on gait whatever the settings used. GPi stimulation at 10 Hz was ineffective. For patient 4, dysarthria was less pronounced and both the dystonia and choreic symptoms were improved at 40 Hz stimulation compared to the "off' condition. However, GPi 120 Hz stimulation clearly worsened chorea and induced drooling. There was no apparent improvement in hypotonia, and walking remained impossible without help whatever the stimulation parameters used. GPi stimulation at 10 Hz was ineffective. Contacts 0 and 1 were located within the GPi. Contact 2 was at the border between the GPi and GPe on the left, and in the GPe on the right (Fig. 6). Contacts 3 were within the GPe bilaterally. All of the contacts were located slightly more laterally in patient 1 than in patient 2 due to larger ventricles.